April | 2011 | "A Place for Learning"
Meet Kristin. Here she is with her very first painting. Great, right? 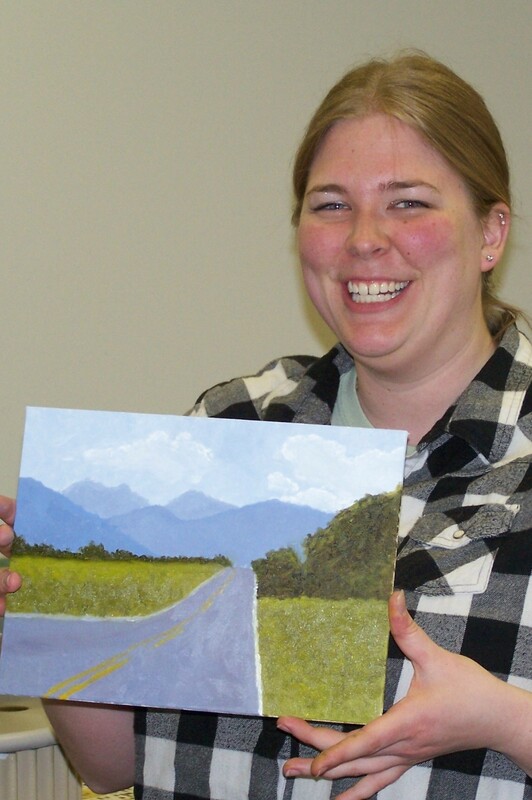 And here she is with her second painting. She’s doing great and learning so fast. You can too. 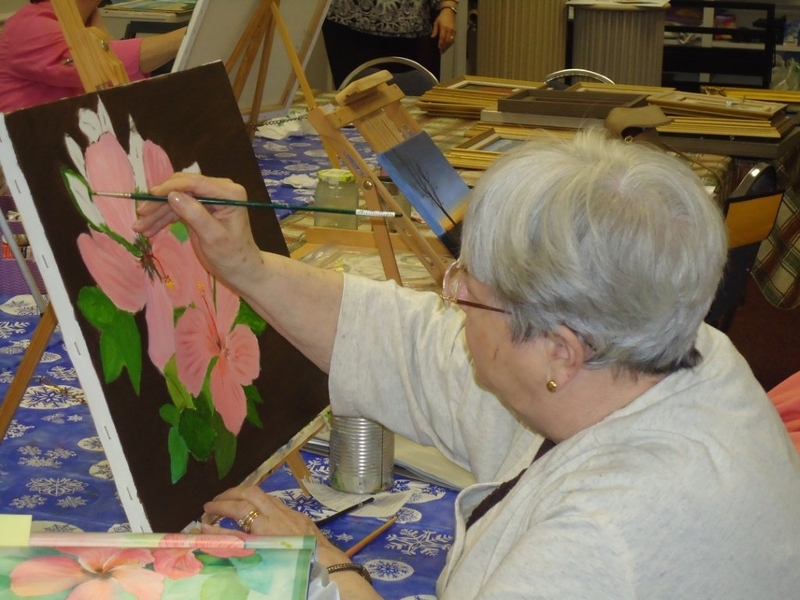 Join us for art class on Wednesday or Thursday evenings from 5:30 – 7 p.m. at the Blue Ridge Arts Council. Just ask Pat. She’ll tell you how much fun it is and how easy it is to learn. Or ask Shelly, Heidi or Mary Lou. 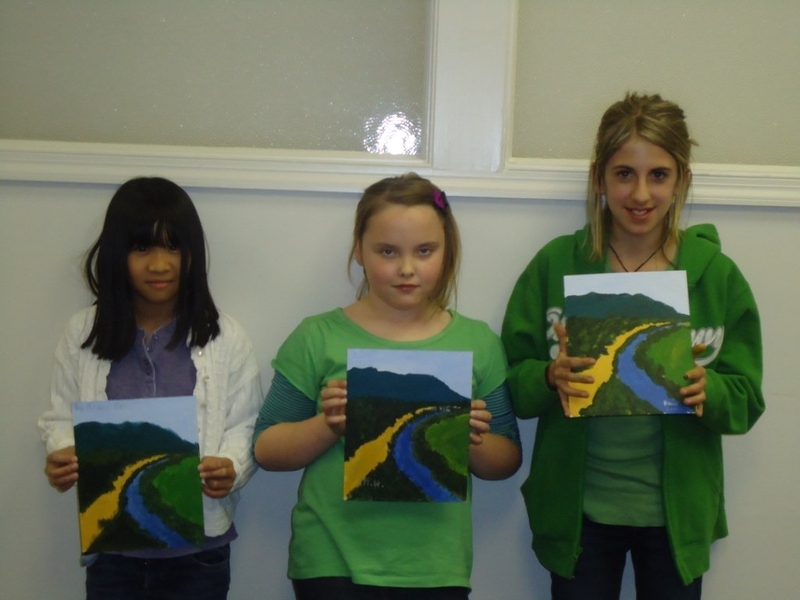 They are all making great paintings in the Wednesday class. Interested? Contact me at kwalker@doubledogdesigns.com and I can give you more information. Come join us tonight! Dan, Dan the Popocorn Man! 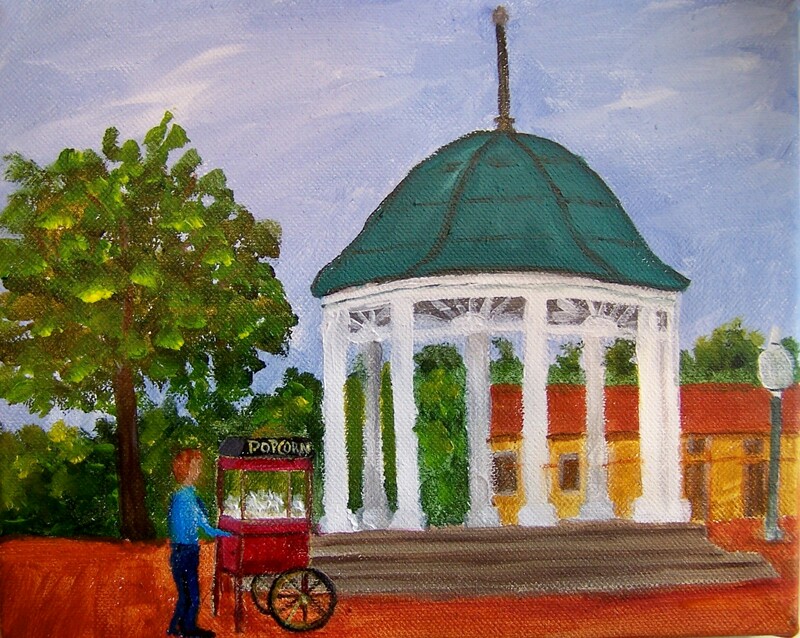 Dan, Dan the Popcorn Man is an acrylic on canvas measuring 8″x10″. 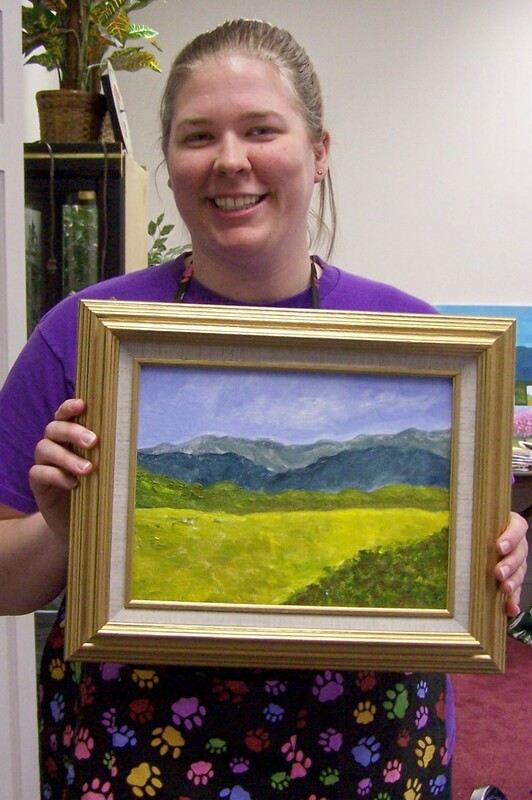 This piece was commissioned by the Blue Ridge Arts Council as a gift to the organizations Volunteer of the Year. Dan Lenz has been a big supported of BRAC, serving on the board and volunteering since the organization was founded in 1987. He is best known for the popcorn he makes at the Gazebo Gatherings every summer. Congratulations Dan. Well deserved. Yesterday, Kym and I appeared on Warren County Today radio show with Mario Retrosi. 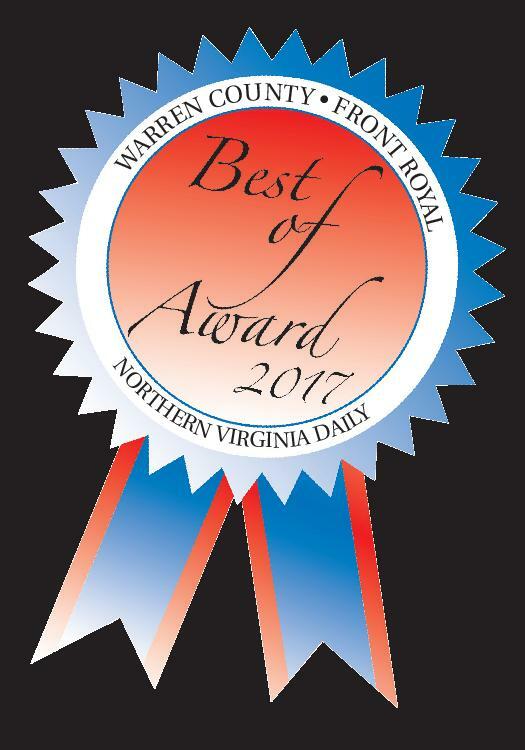 We talked about the Art Residency project with the 4th graders, the “Bark for the Park” Art Show and Sale at the Community Center, and the upcoming art shows at the Blue Ridge Arts Council. 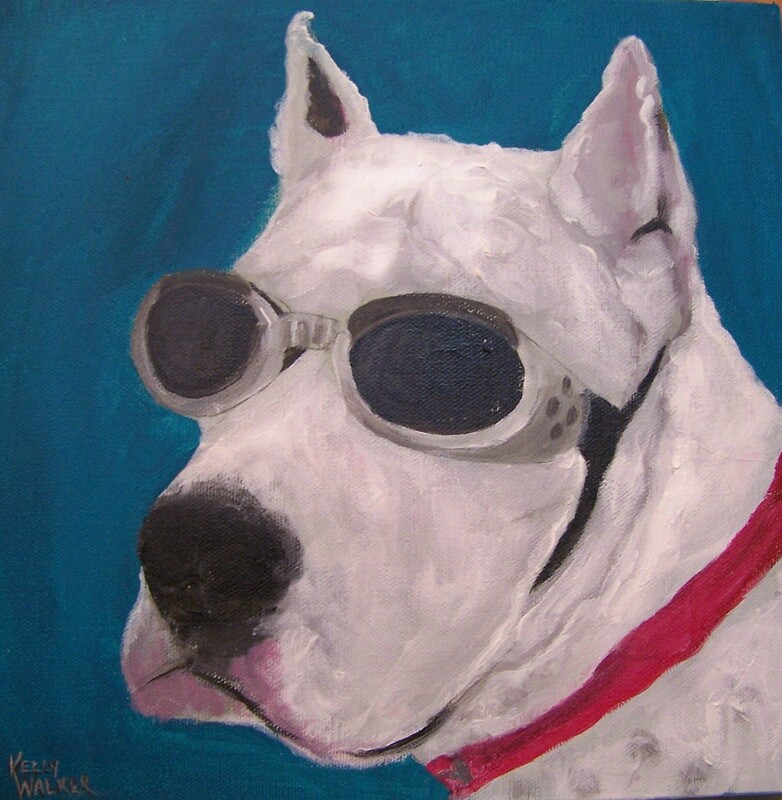 I love a dog in “Doggles”! So cute. This sweet girl belongs to a childhood friend of mine in Georgia. Adorable!!! Yesterday I was asked if I ever have time to paint since I have been teaching so much lately. And the answer is yes! Of course, with the Anniversary project I did with the 4th graders I painted a sample painting so their were about a dozen different subjects that I worked on so that I could simplify subjects for them to paint. This painting is a spin-off of that. 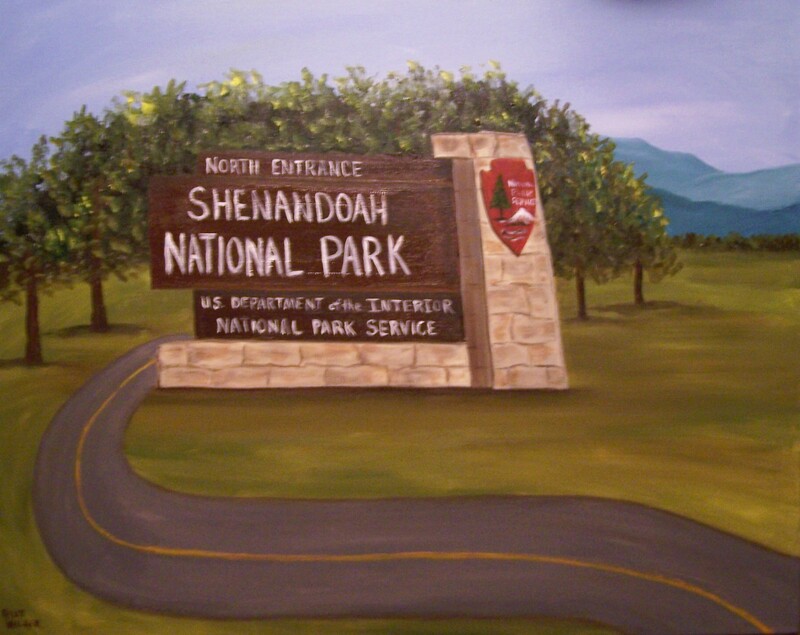 I painted North Entrance, an acrylic on 20″x30″ canvas, for the current show at the Blue Ridge Arts Council celebrating the 75th Anniversary of the Park. You can see it at BRAC for the next month. There is some lovely work in the show. Take the time to stop in and take a look. While showing you the mountain and rivers that the Tiger Cubs painted yesterday I thought I would show you what the Young Artists on Wednesday and Thursday did with the same subject. They did a fabulous job. I love seeing what they can do! A few weeks ago one of the moms of one of my Thursday Young Artists asked if I might teach her Tiger Cub scouts a lesson in color mixing and painting. Last Wednesday, we held that class. 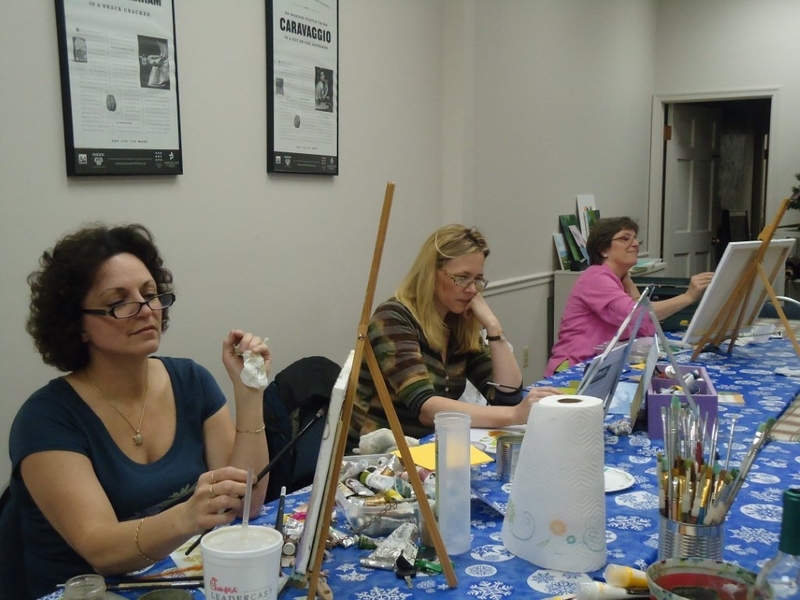 Here they are working on their painting. That’s my friend Shelly helping me with the large group. 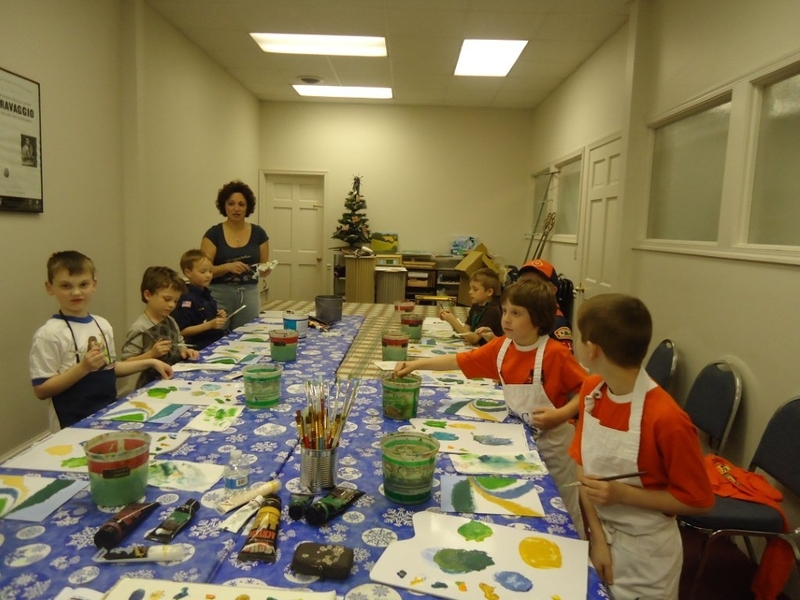 They were very enthusiastic and seemed to really enjoy painting. The only mishap was when I accidentally dropped a paint brush on one boys head when I was trying to help him. No permanent damage, just a little green paint in his hair. Oops! 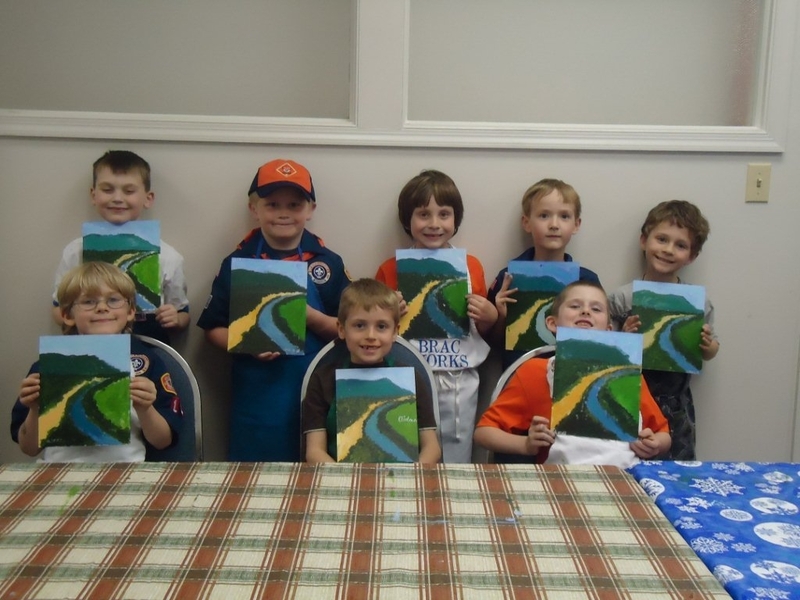 They did a terrific job…eight beautiful paintings of the mountain and river!